The CMC Correlative Microscopy Coverslips are made using a polyester based film with unique reticle patterns. They are specifically designed to allow indentification and location of particular areas of interest with brightfield or fluorescence microscopes and then processing for electron microscopy. The material of the CMC correlative microscopy coverslips is compatible with cell culture growth and exhibit good adhesion for cell cultures. The CMC correlative microscopy coverslips are not designed to replace the optically superior quartz or glass coverslips; the film itself has a structure which can be visible in certain illumination conditions. The CMC correlative coverslips are designed for correlative microscopy using different imaging techniques. An initial general analysis is performed using light microscopy and then the sample is further processed for SEM or TEM analysis. The key advantage is that the film is easily cut and punched to allow EM processing. CMC35 - 10 x 10 grid of 1mm squares. Each individually indexed 0-99. Total area 100mm2. 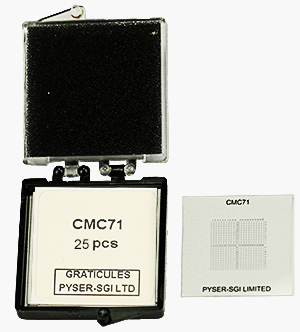 CMC71 - 20 x 20 grid of 0.5mm squares. Indexed 1-20 along the top, A-T down the side and repeated on centre cross. Total area 100mm2.